The most common hormone problem encountered in dogs is hypothyroidism. It results when the thyroid gland does not secrete an adequate quantity of thyroid hormone called thyroxine. Many internal organs are affected, and the resulting problem depends on which organs are most affected. 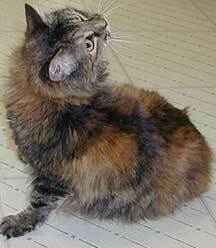 Cats do not get this problem, but get an opposite problem called hyperthyroidism. Their problem involves excess thyroxine and its effect on the internal organs. The thyroid gland is a small gland located at the throat, near what might be termed in people the "adam's apple". It has two lobes, and can be felt with careful palpation. In this view of the thyroid gland you can also see the parathryoid gland at the far left and the lymph node underneath. The role of the thyroid gland is to take iodine and convert it into the 2 main thyroid hormones; thyroxine (T4) and triiodothyronine (T3). T4 and T3 then circulate through the bloodstream and affect the metabolism of every cell in the body. To control the level of these hormones the hypothalamus and pituitary secrete compounds called releasing factors. 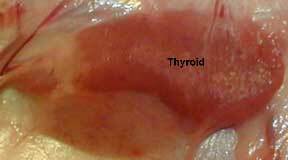 In the case of the thryoid gland, they secrete a releasing factor called thyroid stimulating hormone (TSH). It is the amount of TSH circulating in the blood stream that tells the thryoid gland how much thyroxine to secrete. In a very refined feedback mechanism between the hypothalamus, pituitary, and thyroid gland, the cells of the body get just the right amount of T4 and T3. Thyroxine circulates throughout the bloodstream and affects almost all organs. It plays a major role in controlling metabolism, and is needed for growth. This cause, also known as autoimmune thyroiditis, occurs when the body makes antibodies against the thyroid gland. This effectively destroys part of it, so it has less thyroxine to secrete into the bloodstream. It is one of the most common causes of primary hypothyroidism. This cause of hypothyroidism can start early in life. Symptoms will appear when it progresses to the point that the reserve power of the thryoid gland is affected. In this form we do not know the cause, which is why it is called idiopathic. Secondary hypothyroidism accounts for only a small percentage of cases. It arises when there is a lack of TSH, or secondary to some medications or diseases. There are other causes of hypothyroidism that are encountered only rarely. Thyroxine affects many internal organs, so a deficiency can have various symptoms. Classic symptoms include mental dullness, lethargy, obesity, and heat seeking behavior, although many hypothyroid dogs do not have any of these symptoms. Early diagnosis of hypothyroidism is beneficial because a dog can have this disease and not show any symptoms for many years. In every disease we treat, the sooner we start the better-this applies particularly to hypothyroidism. This is the most common manifestation of hypothyroidism. Typical skin symptoms include symmetrical hair loss (alopecia) along the trunk, although the hair loss is not consistently symmetrical. The hair coat is thin and dull, the hair easily falls out, it grows back slowly, and shedding occurs more often. Sometimes the hair coat resembles that of a puppy. Alopecia, if it occurs, is more common at pressure points and the tail. The skin might be cool to the touch and be darker (hyperpigmentation) than normal. A leathery feel called lichenification might also exist. Hyperpigmentation and lichenification usually occur when the problem has been long-standing. Also, the skin might be greasy due to seborrhea, and inflamed due to secondary bacterial or fungal infections. These secondary complications might cause excess scratching (pruritis) and odor. They skin lesions present in hypothyroidism mimic those in other skin conditions, especially allergies. This terrier has hyperpigmentation on its neck. Hypothyroidism is not the only potential cause of this condition. The ears can be affected, resulting in hair loss, inflammation and infections. Neurologic signs might be seen, and include dullness, mood swings, muscle wasting on the head, facial paralysis, head tilt, disorientation, muscle weakness or paralysis, and lameness. On very rare occasions there will be seizures, and coma. Two specific diseases associated with hypothyroidism are megaesophagus and laryngeal paralysis. A loss of smell and taste are also possible. This is a severe head tilt in a cat. There are numerous other causes to head tilt, most of them are more likely than hypothyroidism. The cornea might undergo fat (lipid) deposits or become ulcerated. Changes with adequate tear production along with internal structures of the eye could occur. 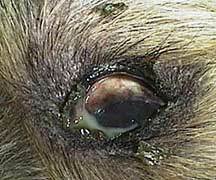 When a dog does not produce enough tears to keep the cornea moist it develops a disease called keratitis sicca. A tenacious discharge adheres to the eye and makes it susceptible to many problems. Diarrhea, constipation and vomiting, if they occur, could occur in hypothyroid dogs. Abnormalities in heart strength, rate and rhythm, along with atherosclerosis, could occur. Arrhythmia's are usually diagnosed with an electrocardiogram (ECG). This is a lead II ECG on a pet with a heart rate of 106 beats per minute. Inadequate thyroxine makes the immune system less effective at fighting infections, especially the bacterial skin infections (pyoderma) that occur secondarily. Suppression of the immune system might even increase susceptibility to demodex. Anemia is the most noted symptom. anemia is not a disease but a sign of disease. It occurs when the red blood cells are low. There might also be a bleeding tendency, low white blood cells from bone marrow suppression, and low platelets. This blood sample shows three different tests on a CBC that check for anemia. Breeding dogs might have abnormal heat cycles, infertility, and high puppy mortality. Testicular atrophy and low sperm, or no sperm. In addition to low thyroxine, hypothyroidism is implicated in sugar diabetes (diabetes mellitus) and addison's disease (hypoadrenocorticism). 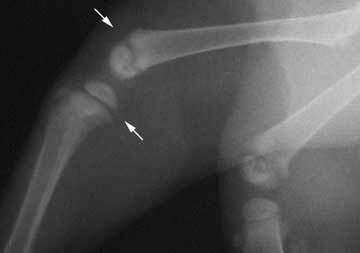 Thyroxine is essential for the development of bones in young animals. The arrow point to growth plates, areas of bone growth that allow the bones to grow longer. The top arrow points to the end of the thigh (femur) bone, the bottom arrow points to the beginning of the shin (tibia) bone. Due to the vast number of organs influenced by thyroxine, and the fact that many skin conditions have similar symptoms, numerous diseases have to be kept in mind when making a diagnosis. These include Cushing's disease, skin allergies, sarcoptic mange, demodectic mange, and Ringworm. A thorough approach is needed for a correct diagnosis of hypothyroidism. In every disease we encounter we follow the tenet's of the diagnostic approach to ensure that we make an accurate diagnosis and that we do not overlook some of the diseases that are also encountered in pets as they age. Hypothyroidism can occur at any age, although it tends to be a problem that affects middle aged and older dogs, especially the larger breeds. Hypothyroidism disease is suspected in any pet that has some of the symptoms described above, particularly the skin symptoms. It is important to remember that some dogs do not show any symptoms early in the course of the disease. This is another reason for yearly exams and blood sample with thyroid test in dogs and cats 8 years of age or more. Other findings include skin infections that recur after antibiotic therapy is stopped. There is no one test that definitively diagnoses hypothyroidism, save for a thyroid biopsy. A CBC (complete blood cell) and biochemistry panel should be run on every dog 8 years of age or more, especially if they have any of the symptoms of hypothyroidism. The CBC might show anemia or an elevated WBC (white blood cell count). The anemia is due to thyroxine's direct effect on red blood cell production, the elevated white blood cell count (leukocytosis) is due to secondary bacterial infection. The biochemistry panel might show an elevated cholesterol. Diet can influence this test, along with how long after a meal was the blood sample for this test obtained. To be accurate there should be a 12 hour fast when assessing cholesterol levels. Liver tests might also be elevated, presumably from fatty changes that occur in the liver due to abnormal metabolism. The biochemistry panel is very comprehensive. This high cholesterol alerts us to keep hypothyroidism in our tentative diagnosis list. 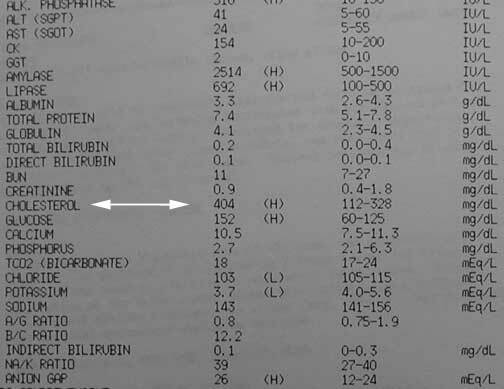 Notice the elevated amylase and lipase tests above the cholesterol test? These are indicative of pancreatitis, which is exactly what this dog has. Many factors affect the level of thyroxine that circulates in the bloodstream, including normal fluctuations. As a result, there is no blood sample that definitively makes a diagnosis of hypothyroidism. Over the years many different test have been developed to help us detect adequate levels of thyroxine in the bloodstream. Our goal is to diagnose those cases where the problem is not so obvious, and also not to over diagnose this condition. Our routine blood sample has an add on test called a T4 test. If this test is normal, everything else being equal, a dog probably does not have hypothyroidism. 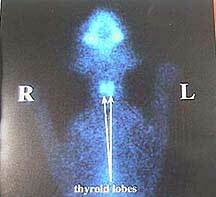 This routine thyroid test by RIa (radioimmunoassay) is at the high end of normal. This dog most assuredly does not have hypothyroidism. The first scenario is called the sick thyroid syndrome or nonthyroidal illness (NTI). In this situation the thyroid gland is normal, but there are factors that are suppressing it from secreting a normal amount of thyroxine into the bloodstream. These factors include medications like cortisone, valium, anticonvulsants, and sulfa antimicrobials. Diseases like Cushing's disease, diabetes mellitus, chronic renal failure, liver disease, and addison's disease can also cause NTI. When these factors are corrected, or these diseases are treated, the apparent hypothyroid problem corrects itself. No treatment with supplemental thyroxine is needed. In the second scenario the thyroid gland is having a problem secreting adequate thyroxine due to one of the causes previously mentioned in the causes section. This is the hypothyroidism we need to treat with supplemental thyroxine. How do we differentiate between a true hypothyroidism from the sick thyroid syndrome. We have another blood sample that aids us, called the free T4 test by equilibrium dialysis. If this is low, and the signalment, history, and physical exam are consistent with this disease, then a diagnosis of hypothyroidism is made. Biopsies of the skin can show changes associated with hypothyroidism. These changes can also occur with other skin conditions though, especially those involving the endocrine system. The comments section of this skin biopsy report mentions endocrinopathies (hormone diseases like hypothyroidism) and corticosteroids (cortisone) as possible additional causes of this dogs skin problem. This is the most reliable test to confirm a diagnosis of hypothyroidism. It eliminates some of the variables that suppress thyroxine production by the thyroid gland. Unfortunately, it is difficult to find TSH of animal origin. Human recombinant TSH is a possible replacement, but cost might preclude its use. An actual biopsy of the thyroid gland can be taken. This test is rarely utilized since there are many other good tests that are not so invasive. One of the tenets of the diagnostic process is whether or not a treatment that is instituted actually corrects the problem. This might apply in hypothyroidism, but it might not. In some situations we have no choice but to try supplementation. We reserve this for cases when the thyroid tests are suspicious (normal but at the low end of the normal range), we find no evidence of other disease processes, and the dog has symptoms consistent with hypothyroidism. This approach has disadvantages though. Since thyroxine affects metabolism, an increase in metabolic rate due to supplemental thyroxine might correct some of the symptoms encountered, even increasing hair growth. This does not necessarily mean that these symptoms that were consistent with hypothyroidism were actually caused by hypothyroidism. A delay in the correct diagnosis leads to a delay in proper therapy and a worsening prognosis. If a dog has sick thyroid syndrome it is treated by correcting the underlying problem. This might include antibiotics for secondary bacterial infections, or the elimination of drugs like cortisone. When hypothyroidism is correctly diagnosed, the treatment, called levothyroxine (T4), is continued for life. 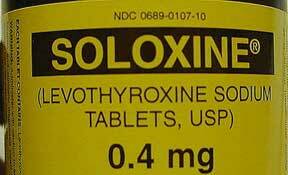 Levothyroxine has various trade names, including Soloxine and Synthroid. This is the brand we use. It is best to stay away from generic levothyroxine because it is not absorbed as well as the name brand version. Medication is given every 12 hours. A thyroid level needs to be checked initially at 1 month to make minor adjustments. The thyroid pill should be give 4-6 hours prior to the recheck blood test. It is then checked every 6 months in order to refine the dose, because the body does change in the amount of thyroxine released by the thyroid gland. Also, as pets age, their cells vary in their need for thyroxine. In the first week of treatment many dogs will be more alert and more active. Within one month improvement in problems related to metabolic changes will be noted, and within 2 months most skin conditions will be improved. If there is no response to therapy within 3 months, and the proper dose and type of levothyroxine are being used, then further diagnostic tests are needed to look for other diseases. It might take 6 months or more for all changes to return to normal. It is possible to overdose your dog with levothyroxine. Symptoms include excess drinking and urinating, restlessness, and increased appetite. If you suspect this is occurring stop medicating and bring your dog in for an exam. Checking the thyroid level every 6 months will help eliminate this problem. Pets that have heart disease, diabetes mellitus, or Cushing's Disease(hypoadrenocorticism), may need altered doses of medicine if they occur concurrently with hypothyroidism. The dose of levothyroxine in these pets, if used at all, needs to be conservative to prevent other problems. An additonal treatment modality is called VOM. It is a non-invasive and non-painful way to stimulate the nervous system to help the thyroid gland heal on its own. Since this disease has a strong genetic component selective breeding can help minimize occurrence. Screening for anti thyroid antibodies in breeding animals can be utilized once they have reached puberty. These antibody tests are sent to special labs at Michigan State University or Cornell University. The use of VOM can have substantial positive effects in this disease.